Last weekend we had a family wedding. It was a beautiful sunny day for the outdoor ceremony. And I got to spend time with some of my favourite people. I did my first camping trip in a very long time. 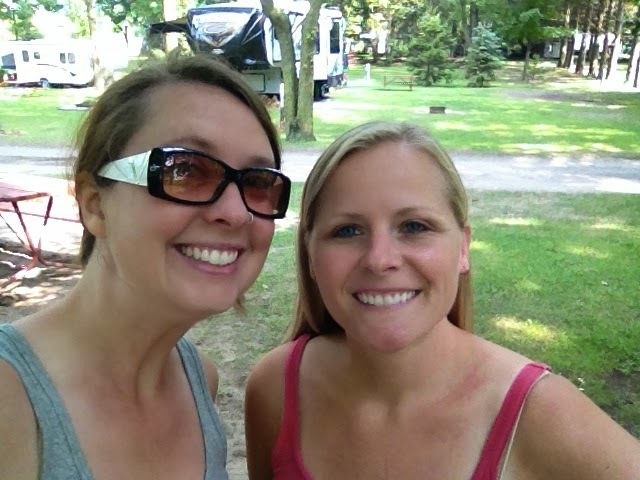 My friend Kim loves to camp and has tried to convince me the last few years to go. I've been getting in touch with my getting-in-touch-with-nature gene and agreed to go. Although it was a little cool for the beach, we avoided rain and I finished a book I had been reading. It was relaxing to have nothing on the agenda except sitting in my lawnchair or walking the beach. Despite vowing to never do it again the last time I had one, I hosted a yard sale during Old East Village's community wide event. The day was a gong-show from the beginning. I caught a cold the day before, it rained, I sold $32 worth of my junk (not a great hourly rate of pay if you average it out!) and to top it off, I got a $35 parking ticket at the end of the day for parking in front of my own house. That's right...it cost me $3 to have that yard sale. Never again! I finally got to take my sister Connie out for her birthday! We had a great night out at Olive's followed by a Long John at Global Donuts. (who knew their donuts were so amazing? Well, Connie did!) It was nice to spend some uninterrupted time together with my sis. My Uncle Cliff, Aunt Penny and cousin Carol Ann came to visit...all at the same time! It was a mini-Murray reunion. We don't get to see each other nearly enough so it was such a fun night spent on the patio. And, it just happened to be on National Cousins Day. Next year we have big plans for a big reunion! My trip to New Orleans deserves its own post but I will say that I held a baby alligator. No kidding. In addition, I've had lots of lunches, coffees, dinners and campfires with friends here and there. I'm almost looking forward to things settling down when September hits!